gdseller2014 has no other items for sale. With the Sony SEL 35 millimeter f/1.8 OSS lens, you can capture smooth, blur-free images. This durable product is excellent for capturing a wide variety of photos that will awe your audience. Take photos while strolling through your favorite environment, night shots, nature shots, and portraits. Choose to adjust each shot so that you can get beautifully defocused background to hone in on your subject. Instead of a standard polygon-shaped lens, this lens features a seven-blade circular aperture for a more natural rounded defocusing.With the SEL35F18 OSS lens, you can get high-speed, rapid focusing thanks to the internal mechanism that secures the barrel. With the barrel securely mounted onto your camera due to its compact design, you can get a faster autofocus response. This prime lens reduces minimum focusing distances so you can get crystal-clear, detail-rich shots of your subject. Additionally, with the built-in optical SteadyShot image stabilization, you can take pictures that are sharp and crisp. Enhance your photography with images that display optimal sharpness and bokeh when you mount this product on your camera.The Sony SEL35F18 35 millimeter device has an E-mount lens with APS-C format with an aperture range of f/1.8 to f/22. The SEL35F18 features an ED element and two aspherical elements as well as a linear autofocus motor for internal focusing. Get up close shots with this lens that has a minimum focal length of 12 inches for the best results. The filter diameter is 49 millimeters so you can adjust your focus to fit your subject and photographic vision. This manual focus Sony 35 millimeter device can create crop frame images at a professional quality.Even with the wide-open lens, you can capture all the brilliant details of your shot each and every time. With the optical image stabilization system, you can benefit from four stops' worth of shake control in any environment. This product is great in low light conditions and is excellent at tracking moving subjects that you want to shoot. Inherently, this product is perfect for shooting videos since it is virtually quiet as it focuses on your subject. Its quiet operation, smooth focusing, decreased lens-drive noise, and extended aperture control make it ideal for filmmaking.This Sony product also features direct manual focus that allows you to resume manual focusing after adjusting focus with the AF. This is invaluable when the AF cannot lock onto a subject or focuses on an unintended subject in the frame. You can also get fine focusing when shooting portrait shots with a shallow depth of field to produce stunning results. This Sony product is one of the affordable APS-C lenses that is perfect for whatever type of photography you love. You can search for your subject and focus in with ease.This product is ideal for graduated and polarizing filters for your convenience. It is also capable of taking shots at approximately as slow as 1/6 of a second. Its chromatic aberrations are well controlled to give you outstanding results that you demand. It is lightweight and excellent for traveling and can be mounted on your camera with ease. I bought this lens just before the birth of my 1st daughter, for use with a Sony A6000 (APC-C, 1.5X crop) body. Good bokeh, great with OSS and love the pictures it lets me take in low light conditions. Focal length worked excellent to take pictures in hospital of new born, mother & 1-2 family members. Was considering SEL50F18 due to cheaper price - so glad I finally went 35mm instead. 50mm would have been far too tight or distant (interaction) on many occasions in both hospital as well as home. 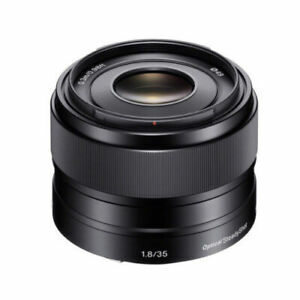 With this experience my next lens will definately be a Sony 28mm f/2.0 rather than 50mm f/1.8. I definitely enjoy closer interaction and 28mm will allow for some wider context photos when baby grows older. Should also note I own kit lenses 16-50mm and 55-210mm, none of which I felt the need nor desire to use over the 35mm this first week with our new born. Performance - This lens produces sharp images. The focus motor is quiet, iso is kept low with the wide aperture. Ergonomics - This lens is lightweight, so it does not throw the camera out of balance or cause hand fatigue. The focus ring is wide, smooth, and easy to turn. Value - Mediocre; 30mm 2.8 other brand lens could be had for half the price, and would produce decent images. I see no real reason to own both 50mm and 35mm lenses, as they are both portrait lenses. I prefer the 35mm, but it's not worth double the price in my opinion. Buy again? - I would never pay full price for this lens. If Sony ever comes out with a wider low light OSS lens at a reasonable price (not zeiss price), I'd buy that one in a heartbeat. Great little lens for low-light and autofocus speed, blur and sharpness. I got this lens for my Sony A6000 to have a good option for low light photography and get some nice background blur. Often I am using the lens for spontaneous moments of my children, indoors and outdoors as well. Autofocus speed is great - this is difficult to compare, because it depends on camera setup and lighting conditions - with the A6000 it cooperates with PDAF focusing. For video, continuous focusing also works like a charm. In low light, and when I need the 35mm standard angle of view, I am better off with this lens then with the Zeiss 16-70mm. The very compact size of this lens is also appealing! What is less-than-perfect about this lens? Well, build quality is okay, but rather thin metal on the outside, and two different shades of black - actually, I don't care about this. Manual focusing is "by wire" i.e. coupled electronically - no mechanical contact between your hand and the focusing mechanism. Picture quality: I think this lens delivers very nice images, sharp, good contrast, little distortion, little flare, little aberration. Aperture f1.8 is very usable, except for macro. The lens looks strange with the concave, and rather small front element, does not look similar to a large aperture DSLR lens, but the picture quality is in the same league as DSLR lenses with similar focal lens, aperture, and price range. Bokeh is sometimes strange: usually soft, creamy bokeh as one expects from this kind of a lens, but occasionally, the aspherical lens element causes the bokeh to have that "onion ring" look (search for aspherical lens bokeh images to see what I mean). I can live with that - the aspherical lens element is there for a good reason... Overall, I am impressed by this lens, and I am using it very often, due to its size, low light, autofocus, and picture quality capabilities. Great lens (maybe the only one you'll need) for the Sony a6000. Very sharp, clear, definition is superb, excellent contrast and color saturation. Surprised I could do some macro photos with this lens as well. Perfect focal length matches what I am seeing with my eye. Doesn't do landscapes well for that pick up the 24mm. This lens will work for everything else.